The irony inherent in the reception of much so-called avant-garde music is that it seeks no more or less than presumably conventional music to illuminate the everyday. The forward-looking nature of Ives’ adventurous composition can be exaggerated, when we make the mistake of thinking too little of the world in which he came of age (he lived from 1874 to 1954). Recorded on Monday, March 28, 2011 – a field recording – while waiting for my daughter to finish school band practice, I realized that another band of older students was practicing nearby. This is the overlap, plus some hallway sounds. Track originally posted at soundcloud.com/markrushtoncom. More on Rushton at markrushton.com. The ”ecological” view isn’t confined to the organic world. Along with it comes a new understanding of how intelligence itself comes into being. The classical picture saw Great Men with Great Ideas…but now we tend to think more in terms of fertile circumstances where uncountable numbers of minds contribute to a river of innovation. It doesn’t mean we cease to admire the most conspicuous of these — but that we understand them as effects as much as causes. This has ramifications for the way we think about societal design, about crime and conflict, education, culture and science. PhD Blogs: Outboard Brains or Syllabi: Thomas Patteson started acousmata.com in February 2009. He’s in the PhD program in music history at the University of Pennsylvania, in Philadelphia. The blog-as-research-repository has been especially fertile in academia, where it serves as what Warren Ellis has called the “outboard brain” of individuals trying to wrangle the vast amount of information they come into contact with and find useful. I’m still figuring out how to read these blogs as, like Patteson’s, they’re often untethered to anything other than the author’s ongoing (self)education and unearthings: one day it’s old video game music (Rob Hubbard‘s 1986 work on Zoids), another it’s a composition for monochords by Romanian composer Iancu Dumitrescu. The posts are almost the precise opposite of time-sensitive; instead, at least on acousmata.com, they’re an excellent, flashcard-like ongoing education for his readers. I wonder if in a few years these PhD blogs (phdlogs? dlogs? — and, yes, undergrads and masters students, as well as faculty, make them as well) will be an institutional norm, or if existing ones will themselves become part of future syllabi. Reel Life: In one of several high profile examples of Hollywood film composers crossing over to video games, Hans Zimmer is scoring Crysis 2; there’s a taste at soundcloud.com. … Clint Mansell (best known for his work on Darren Aronofsky’s films, most recently Black Swan) is scoring the next Mass Effect game (I learned this thanks to a comment on the piece I wrote for mediacommons.futureofthebook.org about the Grammy’s myopia in regard to video game music). … Since Clint Mansell scored Moon, the previous film from Source Code director Duncan Jones, it’s probably worth keeping an ear out for Source Code‘s composer, Chris Bacon. … Sonic Youth have scored Simon Werner a Disparu by French director Fabrice Gobert (via thequietus.com). … Andreas Bick has posted at soundcloud.com some music he composed for a forthcoming documentary about German dramatist Heinrich von Kleist. … The Chemical Brothers have scored Hanna, directed by Joe Wright (The Soloist, Atonement). Oughta Be in Pictures: A photo I took of the sign of a club called the Independent here in San Francisco — I shot it because it was impressive how the club had written about the name of the band Sunn O))) — is now up at the location page for the spot at sanfrancisco.schmap.com. More on Edlen’s work at vinylart.info. Few places are as exciting to watch musicians in action, certainly online, as Soundcloud.com. The artist pages on Soundcloud have their own distinct sensibility, as distinct from MySpace as MySpace is from Bandcamp, and on, and on through the mall of malls that is the Internet. Soundcloud, for various reasons, has been embraced as both momentary sketchpad and full-fledged record store by musicians. So while you’ll certainly come across finished tracks and full-length recordings available both for sale and, wittingly, courtesy of netlabels and open-minded musicians, for free download, you’ll also find endless examples of musicians posting works-in-progress. Sometimes, if you’re lucky to happen upon them, you’ll even find examples of those progressions side by side. Tracks originally posted, over the course of the last month or so, at soundcloud.com/katecarr. More on Carr, who is based in Sydney, Australia, at listentotheweather.com. It isn’t a drone. The drone is there, sure, a background thing, like the surface noise of an old jazz record, or the dust in an underutilized chapel. But it’s just part, maybe parcel, but certainly not the whole thing. There seems to be a voice buried in the drone: a melody, snail slow and no less determined, plugs along, plowing through the thick haze. Shoegazer drone rock. Snailgazer. It’s a choral music where the score is a map of the torque of some massive structure in free space, shifting at a pace determined by a processing system overwhelmed by the sheer magnitude of the effort. Sparks fly, circuits short out. The sound is massive and unholy, gothic in its impact but downright rarefied in its implementation. 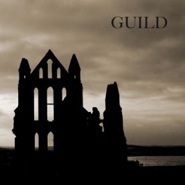 This is “Atonement” by Guild. It’s one of two tracks on Ascension, the other of which takes its name from the album’s title, or vice-versa. According to the brief liner notes, both tracks are the result of a bass guitar put through its paces: “drones effected, looped and processed.” Guild is a name adopted by Mark Midgley, who on his markmidgleyofficial.blogspot.com notes the association between his slomo death pop and the work of My Bloody Valentine and, more recently, Jesu. Midgley is a member of various bands, including Falconetti, Alt, and the Black Lanterns. Album released by the netlabel restingbell.net.